105th ISC 2018 నిరవధికంగా వాయిదా వేయబడింది :: The 105th Indian Science Congress, which was to be held at Osmania University in Hyderabad from January 3rd to 7th, has been 'indefinitely postponed'. The university cited 'security concerns' as the reason for its inability to conduct the Congress. The Vice Chancellor of Osmania University has informed the Indian science Congress association that they are not in a position to host the Congress due to certain issues. Recently, massive protests had erupted on campus after a student committed suicide. The student unions and opposition alleged the suicide was due to rising problem of unemployment in state of Telangana. The move came as a surprise, as the University officials, for last three months, were making preparations for the event. The University had even changed the examination schedule for the event. The University was even willing to allow inaugural programme outside the campus and other sessions on campus even if it meant more expenditure. The ISC is traditionally the first public function the Prime Minister addresses at the beginning of each year. Last year, the event was held at the Sri Venkateswara University in Tirupti, Andhra Pradesh. This year 20 Nobel laureates, along with top scientists and academicians from across the world, were to attend the event. An emergency meeting of the executive council of ISCA has been called on December 27 to discuss the next course of action. 105th Indian Science Congress 2018 Porgramme Schedule: జాతీయ సైన్స్‌ కాంగ్రెస్‌ సమావేశాలు మణిపూర్‌కు తరలి వెళ్లాయి. జనవరి 3 నుంచి 7వ తేదీ వరకు ఉస్మానియా యూనివర్సిటీలో జరగాల్సిన 105వ జాతీయ సైన్స్‌ కాంగ్రెస్‌ సమావేశాలను మణిపూర్‌లో నిర్వహించాలని ఐఎస్‌సిఏ కమిటీ నిర్ణయించింది. జాతీయ సైన్స్‌ కాంగ్రెస్‌ నిర్వహించేందుకు సిద్ధంగా లేమని ఉస్మానియా యూనివర్సిటీ విసి ఇచ్చిన లేఖ ఆధారంగా వాయిదా వేస్తున్నట్లు ఐఎస్‌సిఎ కమిటీ ప్రకటించి, కోల్‌కతాలో సమావేశమైన తాజాగా ఈ నిర్ణయం తీసుకుంది. మణిపూర్‌లోని సెంట్రల్‌ యూనివర్సిటీలో 105వ జాతీయ సైన్స్‌ కాంగ్రెస్‌ సమావేశాలను నిర్వహించాలని నిర్ణయించింది. మార్చి 18 నుంచి 22 వ తేదీ వరకు సమావేశాలుంటాయని పేర్కొంది. ISC - 105th Indian Science Congress 2018 Porgramme Schedule: The Indian Science Congress, which was scheduled to be held here at Osmania University campus between January 3 and 7, will now be held at Manipur University, Imphal in the month of March. The decision to this effect was taken in the Emergency Executive Committee meeting of Indian Science Congress Association (ISCA) in Kolkata on Wednesday. In a public notice, the General Secretary (Membership Affairs), ISCA, Prof Gangadhar said the new dates of the Indian Science Congress will be announced in the coming days. “Members interested to participate in 105th Indian Science Congress at Manipur will have to take up fresh registration. The registration and accommodation fees submitted to the Osmania University, Hyderabad will be refunded by the Osmania University directly to the persons concerned,” the notice added. On Thursday, December 21, the ISCA through a public notice in its website had informed that the Vice-Chancellor of Osmania University had sent an e-mail saying that OU was not in a position to host the 105th Indian Science Congress between January 3 and 7, 2018 due to certain issues in the campus. Following the communication, the ISCA had decided to postpone the event and hold an Emergency Executive Committee to hammer out a new date and venue. The Indian Science Congress Association has indefinitely postponed the conduct of the 105th Indian Science Congress in the University scheduled to be held from 3-7 January 2018. The University in all its earnestness was fully prepared to conduct the event. Several committees worked for the past three months tirelessly to ensure smooth conduct of the event. In fact, the University changed the examination schedule for this purpose. At one point in time, the University was flexible and was willing to have the inaugural outside the campus and the remaining sessions on the campus even if it meant incurring more expenditure and inconvenience. Osmania University in its Centenary year, is state-run and is committed to advancement of knowledge in diverse spheres including science, which has the potential to solve problems facing the society. Our core mission is to serve the public good. In order to fulfil that task and generate solutions that have impact, we often work with diverse organization, segments of society that have a stake in its welfare — government, academe, philanthropies, civic leaders, and the private sector. Given our overarching goal of bolstering science and technology education, we are all the more conscious of our obligation to improve our research including the collaborations with leading organisations. It is in this spirit, we wholeheartedly welcomed the engagement with the ISCA, and thought it fit to conduct the 105thISC to give a fillip to research and have an interface with the scientific community. The University hopes that the Congress would be held in the near future after holding further discussions with the Indian Science Congress Association (ISCA). Ltr.No.81, Dt:07-12-2017: Visit of school children - 105th Indian Science congress: As a part of Centenary Celebrations Osmania University is hosting 105th Indian Science Congress a mega science event, during 3rd to 7th Januar 2018. During this programme, two side events called "Children Science Congress" and "Science Exhibition" will be held during this period. These events are especially designed to inculcate scientific temperament and encourage them to interact with the scientists, who will deliver inspiring lectures. In addition, there will be an exhibition in the form of science exhibits by the children from all over the country. It is a good occasion for the school children to participate the Children Science Congress and Science Exhibition to enhance their understanding and develop keen insight into subjects. In this regard, I request your good office to kindly encourage the students from the schools under your jurisdiction by instructing the RJD's &DEO's to make needed arrangements by issuing necessary orders. We could be able to manage 2500-3000students per day. In this regard, we request you to inform the RJD's & DEO's to coordinate with us to plan visitors to these events. Sub: - School Education–104th Indian Science Congress 2017 – Providing of Links for Inaugural function of 104th Indian Science Congress 2017 - certain instructions issued - reg. All the Regional Joint Directors of School Education in the state and all the District Educational Officers in the state are informed that the Indian Science Congress 2017 is going to be conducted at Tirupathi from 3rd January 2017 to 7th January 2017. The said programme will be inaugurated by the Hon'ble Prime Minister of India and Hon'ble Chief Minister of Andhra Pradesh on 3rd January 2017. The Children Science Congress will be inaugurated by the Hon'ble Chief Minister of Andhra Pradesh on 4th January 2017. The Indian Science Congress Association (ISCA) owes its origin to the foresight and initiative of two British Chemists, namely, Professor J. L. Simonsen and Professor P.S. MacMahon. It occurred to them that scientific research in India might be stimulated if an annual meeting of research workers somewhat on the lines of the British Association for the Advancement of Science could be arranged. - To publish such proceedings, journals, transactions and other publications as may be considered desirable. - To secure and manage funds and endowments for the promotion of Science inlcuding the rights of disposing of or selling all or any portion of the properties of the Association. - To do and perform any or all other acts, matters and things as are conductive to, or incidental to, or necessary for, the above objects. 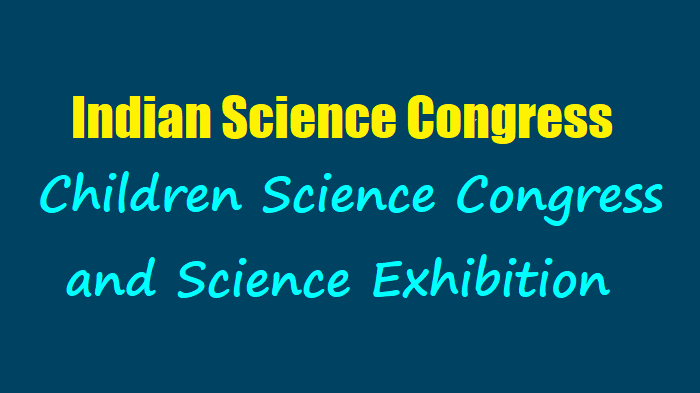 As the above programme is useful to the children in getting better understanding about the Science and Technology and also to facilitate an interaction with the dignitaries and scientists it is decided to broadcast the entire programmes of Indian Science Congress 2017 through the following links. Therefore, all the Regional Joint Directors of School Education and all the District Educational Officers in the state are instructed to issue necessary instructions to all the Schools where the internet connectivity is provided. Apart from the links the entire programme will also be broad casted on Mana TV. So, they are once again requested to issue circular to all the Schools informing about the broad casting through various methods and instruct them to watch the programmes as per the schedule appended to this. Together, we will prevail to make a just, equitable and prosperous nation.